Here’s an incredible chart from Microsoft’s last earnings report that didn’t get the sort of attention it deserves. The Server and Tools division generated more revenue than the Windows division in the last fiscal year. The Windows division is still much more profitable, earning $11.5 billion compared versus $7.4 billion for Servers & Tools. And one of the reasons Windows generated less revenue than Server & Tools is that Windows 7 is at the end of its run. 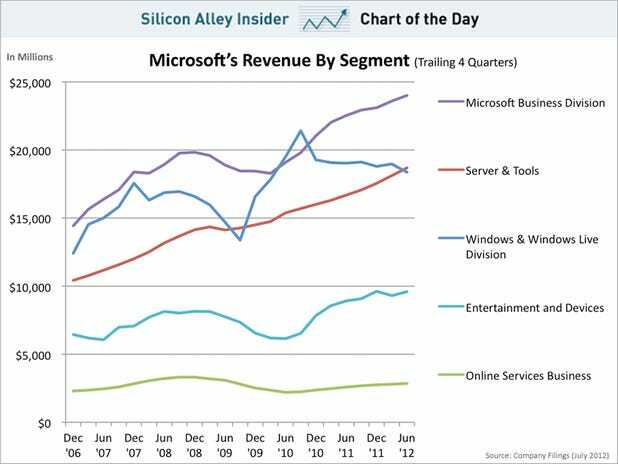 However, this chart is illustrative of a two big trends for Microsoft. First, while Vanity Fair wants to call it a lost decade for Microsoft, it clearly wasn’t all lost since it built a third huge new business division. Second, while people worry about the future of Windows, and whether or not it gets disrupted by iOS and Android, the truth of the matter is that Microsoft is more than just Windows.